Oh yeah, It’s Majid Michael and his wife with the new Celebrity Momm, Yvonne Nelson. A recent photo posted on Yvonne Nelson’s Instagram got a lot of people in a smiling mood as they’re heavily displaying. A picture where Majid was heavily pulling Yvonne Nelson’s hair whiles his wife was comfortably possing behind Yvonne Nelson. 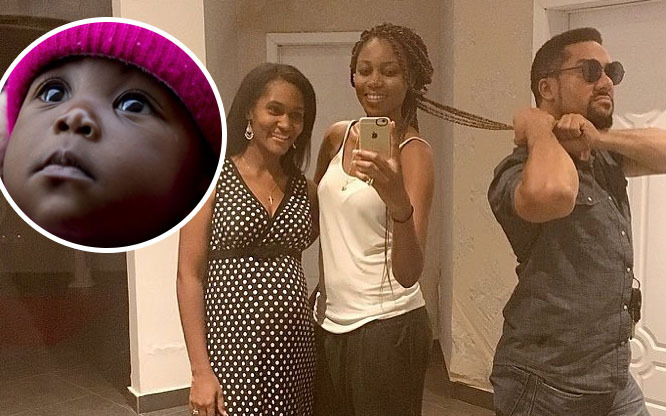 BygoneGh.Com can’t confirm this but I have reasons to believe that, Majid and his Wife visited Yvonne Nelson after the news broke out that Yvonne has given birth to a newly born baby.